Residents of 11 Machias-area towns comprising three separate school governance units—Union 102 (Machias, Jonesboro, Marshfield, Whitneyville, Roque Bluffs, Northfield and Wesley), Union 134 (Machiasport, Cutler and Whiting) and the East Machias School Department—will go to the polls April 29 to vote on a referendum asking if they want to form an alternative organizational structure (AOS). The option to consider forming an AOS came as a result of new amendments to Gov. John Baldacci’s school reorganization law—changes championed by Machias-area superintendent Scott Porter and East Machias officials who were instrumental in securing their passage during the recently ended session of the Legislature in Augusta. The three-year-old school reorganization law, which forces smaller school districts to consolidate into mega school districts or pay annual penalties to the state, has been controversial from the start. Opponents from mostly rural areas of the state where local control has long been championed (urban areas of the state with large school populations were not affected by the law), decried the move toward greater centralization that effectively abolished a small community’s ability to independently govern its own school. Further, the creation of a mega school board in a regional school unit (RSU) compounded the problems already seen in an SAD (school administrative unit). East Machias officials, including selectman Kenneth “Bucket” Davis, cited the politicization of decision-making as the reason his town withdrew from SAD 77 and formed its own municipal school department in 2006, saying the town was subjected to unfair treatment by the three other member towns that often voted as a bloc in their own interests at the expense of the interests of East Machias, which provided the largest subsidy to the district. The action taken by East Machias precipitated the dissolution of SAD 77 four years ago and led to the forming of Union 134 comprised of the three remaining towns (Machiasport, Cutler and Whiting). In a school union, as in an AOS, each of the member towns has its own school board but shares central services. In an RSU, as in an SAD, decisions are based on a one-man, one-vote of the single school board. This creates an environment in which a large town could outvote the desires of a small one, or a big enough group of small towns could ban together in a voting bloc to thwart the will of a large one. In these situations, the decision could result in an inequitable win-lose result, with the prevailing towns gaining something at the losing towns’ expense. For example, a mega board’s decision to close a school could be based not on the quality of the school, as indicated by learning results and other factors, but by one town’s ability to muster more votes in protecting its own, possibly inferior school, putting its community’s interest ahead of what may be in the best interests of the district’s students. The passage of the new state reorganization law, which forced a return to centralized governance, came just as East Machias, Machiasport, Cutler and Whiting began to function under the new, less politicized, decentralized governance structure, an arrangement that was enthusiastically received in East Machias and generally well received in the three towns that comprised Union 134. The threat posed by the new law—a return to the infighting that was dominant in the former SAD 77—spurred the political effort undertaken by Porter and the East Machias officials to amend the definition of an AOS so as to preserve local control. Porter, in an interview last week, said he and other rural education officials have opposed the new consolidation law from the very beginning. They first sought to have the bill repealed through a citizens’ petition, which failed at the ballot box. The Legislature then devised an alternative organizational structure, or an AOS, in response to special cases in the state where school districts did not meet the requirements of an RSU. Porter said he and others were opposed to the AOS in the beginning, citing three key issues—the expansive centralization, the anti-democratic elements associated with prohibitions against getting out of an AOS once in, and the problems with a district receiving one state allocation check and subsidy printout rather than separate checks for each town. The changes to the AOS were resisted by Maine’s education commissioner, Susan Gendron, and the Baldacci administration—until it became apparent in mid-March that they had lost the political battle played out under the Statehouse dome after Porter, Davis and East Machias principal Tony Maker and others spent the past three years educating and lobbying legislators about the need for a revised AOS. They were assisted in their efforts by other rural educators and their legal consultant, Richard Spencer, an attorney with the Portland firm Drummond Woodsum & MacMahon and former legislator who specializes in advocacy involving government. The three major changes are the ones that were approved unanimously by the educational and cultural affairs committee and by the full Legislature at the end of March. Gov. Baldacci quietly signed the bill (LD 570) into law on April 1. Porter and the East Machias officials, working with the Machias-area Regional Planning Committee, in anticipation of the passage of the amendments to the AOS law, initiated a process to create a Machias Bay Area School System this year in order to save the towns from paying $216,978 in penalties were they not to consolidate before July 1. The penalties are calculated on a town’s valuation and the number of students enrolled in the system. Broken down by town, the penalties for this year are as follows: Cutler ($20,697), East Machias ($41,476), Jonesboro ($19,307), Machias ($54,221), Machiasport ($28,799), Marshfield ($14,660), Northfield ($2,246), Roque Bluffs ($15,701), Wesley ($604), Whiting ($14,437), Whitneyville ($4,826). 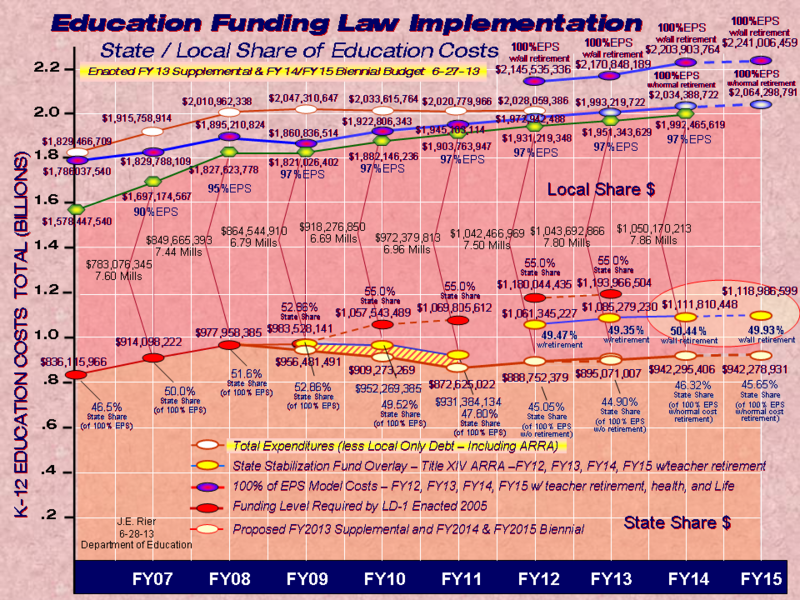 These penalties will continue to grow annually, said Porter, who added that a town seeking to join later would pay a high cost based on requirements set by the Department of Education. “It will take at least two years before a town that rejects the AOS could apply to join. It would take a two-thirds vote of the AOS board and a majority vote of each town’s school board to win admission. The requesting town would then have to have a successful referendum validation vote in each of the member towns, the expense of conducting which would have to be paid by the town applying for membership. It will be financially devastating for those towns that fail to consolidate,” said Porter. Although some last-minute changes were made to the AOS law before it passed out of committee, said Porter, these came from Gendron, who approved adding them after she accepted the political reality that she could no longer prevent the reforms. Gendron realized that the amended law, though immediately helping the Machias-area towns that had championed them, would serve as a “template” for other districts, said Porter, and thus she sought to inculcate some of her own preferences into the language of the law. 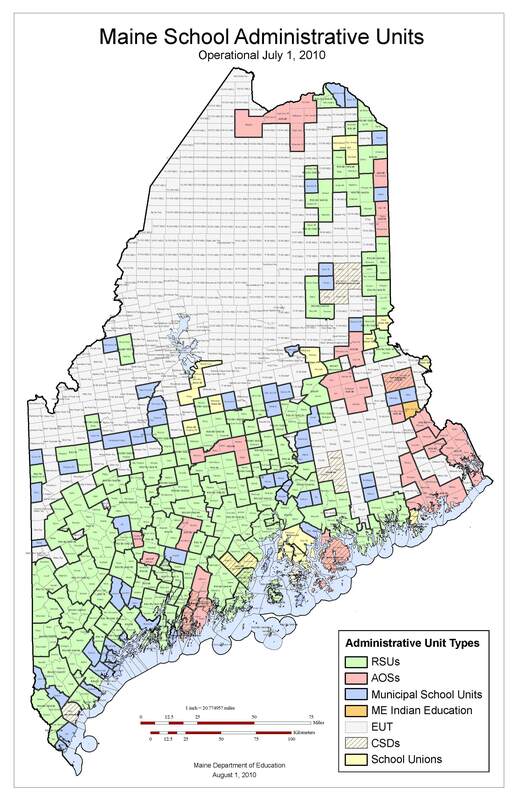 Although most school districts in the state are still not aware of the new AOS law, which has received little media coverage, other districts may come to consider an AOS as an option if they have not already consolidated, as Lubec and Eastport recently did. Gendron last week announced her resignation, effective at the end of April, to accept a position in a Washington, D.C.-based educational consortium. All 11 Machias-area towns have held independent public informational meetings on the proposed AOS in anticipation of the April 29 vote. Most have seen little attendance, said Porter, and little opposition had been expressed until the last hearing in Machiasport on April 15. At the Machiasport meeting, residents Bill and Sandra Prescott raised concerns, not only with the proposal to form an AOS rather than an RSU but also with the process followed in arranging for a vote by the end of this school year. All eleven towns will hold the referendum election on Thursday, April 29. The times that polls are open vary in each of the towns and residents should check with their town office.